I have never been a big fan of jello salads. It was kind of like, what’s the point? Also, they always remind me of Aunt Bethany on National Lampoon’s Christmas Vacation. I make an exception for this particular jello salad. It is special. After my grandma passed away my grandpa met, fell in love, and married a wonderful woman, Marian. We were all so very happy for the both of them. Marian brought this salad to a family holiday when I was a kid and I LOVED it. I loved it so much that I asked her for the recipe. This was probably the first time I ever asked for a recipe and I felt very grown up. Below is a picture of my original transcription. My mom still uses this when she makes the salad. This looks nothing like my handwriting today. I must have been experimenting. 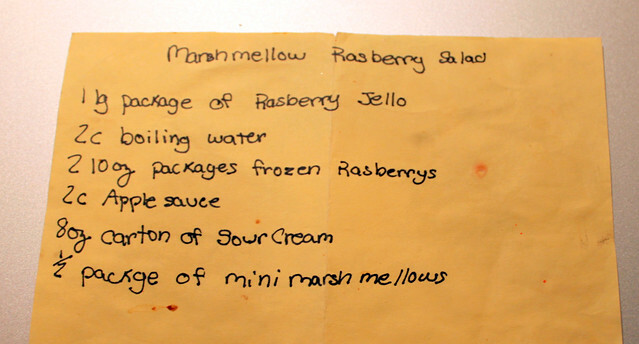 Also, I was old enough to know how to spell marshmallows, raspberries and package. No excuse for that. Nowadays if I want a recipe I just take a picture of it on my phone. There is something to be said about these handwritten, stained, misspelled versions. The base of the salad is raspberry jello, frozen raspberries, and applesauce. The topping sounds odd at first, sour cream and marshmallows, but it is awesome. The marshmallows kind of melt in the sour cream and it makes a heavenly topping. The salad is quite pretty so I suggest showing it off in a clear glass bowl! 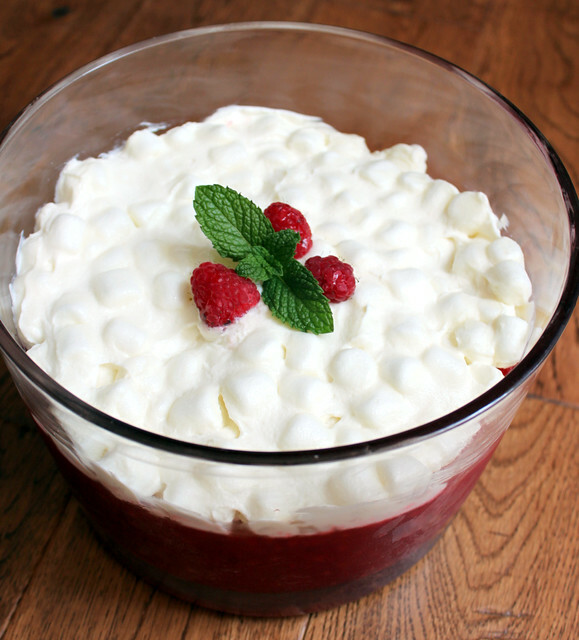 Adapted by Lindsay at Perfecting the Pairing from Marian R.
In a large bowl carefully combine the raspberry jello and boiling water. Stir gently to dissolve. Add the frozen raspberries and applesauce, stir to combine. Pour into a large serving bowl. Allow to set for a couple of hours. 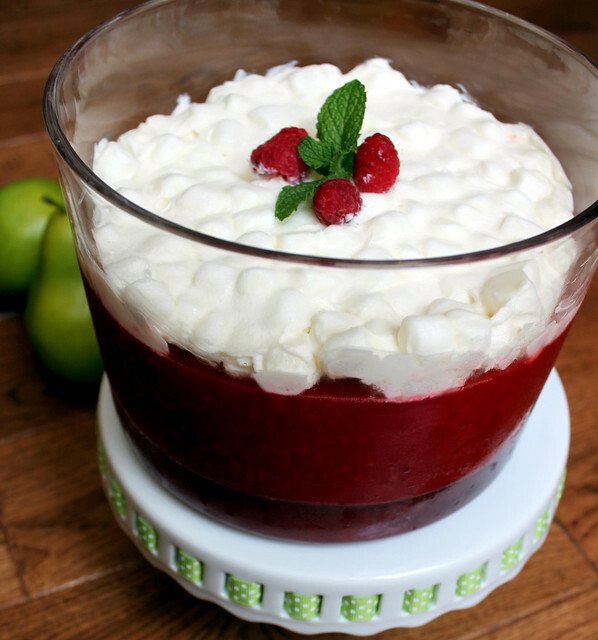 Mix the sour cream and marshmallows in a bowl and spread evenly across the jello. Refrigerate for at least an hour before serving.